While I get caught up after my workcation, here are a couple rumors to keep you busy. First up, I’ve been hearing a lot of buzz about businesses that might go into the new developments down by the arena. We all know there will be a variety of bars and restaurants; that’s not the least bit surprising. What may interest you is that it has been suggested to me that one of the restaurants may be owned by the folks behind Blue up in Omaha. Lincoln’s version, I’m told, will be its own unique concept, so don’t expect Blue 2. Don’t write that one in ink just yet, but let’s file it under “plausible”. Next, the buzz is really heating up about the former Steve & Barry’s location at Gateway. I’m hearing that a non-Marcus theater with “several” screens is getting closer to reality. I’ve heard as many as 10 screens, but is the space really that large? Then again, I’ve also been told that there’s some construction associated with the project so perhaps the space will be expanded. Nothing solid yet on which company is behind it. A theater would be a tremendous boost for Gateway. Will it actually happen? I’m back from my six-day “workcation” in Saginaw, Michigan, where I was one of 216 referees at the USYSA Region II Youth Soccer Regional Championships. I had the chance to work some great games with fantastic referees. Nebraska’s delegation of 16 referees, mentors, and assessors returned safely yesterday. I made the 828 mile trip in about 12 hours 18 minutes. Now that I’m back, I have no idea what’s going on. Apparently some lady named Debbie made waves in Florida, and the Supreme Court is about to do something major. Locally, I discovered that 84th Street is a mess south of O, and the Pioneers Boulevard widening is apparently done. But that’s all I’ve got. If you know of other local goings-on I should be aware of, please let me know! I’ll get back up to speed as quickly as I can. I’d say Lincoln’s new “Life is Right” branding campaign is right on target, wouldn’t you? Ladies and gentlemen, if this is true then it is great news. Kurry Xpress is a super casual Indian restaurant which serves excellent food at very reasonable prices. The breads are fabulous and the curries are definitely hot! You can check out some reviews on Yelp and UrbanSpoon, as well as the OWH review. All I can say is, if you like this kind of food then check these guys out. This is one crazy train headed towards Indian food nirvana, and I am definitely on board. Lincoln’s new branding and marketing campaign has just been announced. Are you ready for it? I’ll let you ponder for a moment whether you love it or hate it before I hop in with my thoughts. ... Ready? The absolute first thing that came to mind when I heard the new slogan was “...and the pro-lifers just went wild”. Taken entirely out of context it’s hard to imagine the slogan being anything but a pro-life picket line chant. “Life is right! Life is right!” Heck, it’s almost catchy. So at first I was completely shocked that somebody would pick a slogan so tainted with political undertones for Lincoln. And not just any political undertone, but undertones of one of the most divisive issues in American history. That’s a pretty big deal, no? That’s my impression of the slogan without any context whatsoever. What if we put the slogan in context? The website doesn’t convey the entire marketing campaign but it gives a basic idea of some of the things we can expect. For one thing, “Life is right in Lincoln because…” has a less charged tone to it. The slogan starts to mean not just “life is good”, but “this is the way things ought to be”. It’s clear why that makes sense as part of a marketing campaign. 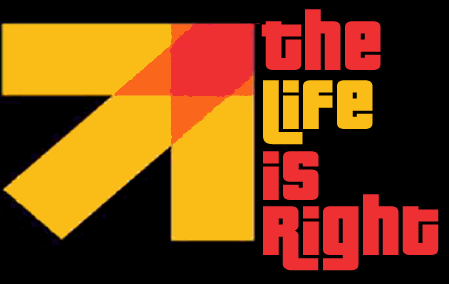 I’m still not completely sold on Life is Right, but we’ll see what the passage of time does for it. It’s not as bad as GOLincolnGO so that’s a plus. Let’s hear it, Lincolnites. Love it, hate it, or don’t give a durn one way or the other? Why Not a Neighborhood Market? One of the oft-presented alternate plans to Walmart’s proposed new store on South 27th Street is that they build a “Market” rather than a “Supercenter”. Before anybody gets too deeply invested in that idea, let’s think about why it’s (probably) not a viable alternative for Walmart. Walmart Markets are not just small Walmarts or Walmart Supercenters. A Walmart Market is a grocery store, nothing more. Proposing a Market instead of a Supercenter is comparable to proposing a bakery instead of a Super Saver. One is a subcomponent of the other, but the two are not interchangeable. I obviously can’t speak for Walmart, but I’d be surprised if Lincoln is anywhere near being in the running for a Market right now. Our grocery store market isn’t hyper-competitive, but the Hy-Vee / Russ’s / Super Saver trio appear to be handling things just fine. Walmart Markets are smaller than Supercenters. Much smaller. Most Markets are around 40,000 square feet, whereas the proposed Supercenter is about three times that size. So although getting a Market instead of a Supercenter might at first seem like a win, it’s probably not. No way would the developer just let that excess square footage go to waste. One would think that the developer would fill up the space with ... well, something. And that something isn’t going to be green space. There will still be delivery vehicles and there will still be traffic. And don’t get me started on the ridiculousness of the suggestion that Walmart could just move out to Highway 77 and Warlick Boulevard, as though that location were somehow equivalent. Remember, Walmart wanted to move out there but the project collapsed. Considering the investments made in that area, if Walmart could make a store happen there on terms it could be happy with, it would happen. It may seem like I’m telling neighbors to just shut up and accept their fate. That’s ... half true. I empathize with them and I encourage them to put up a stink—it’s worth a shot, after all. At the same time, it’s obvious to me that their strongest opportunity to complain passed long ago. They should have recognized what the zoning on that parcel permitted and attacked preemptively. The City’s decision to carve out a space for big box retail in the midst of a neighborhood is just plain bizarre. A year ago it would have been relatively simple to get that changed. But not today. Today neighbors should engage in a flurry of defensive tactics. Think about fences and berms. Think about noise and lighting. Think about signage and trash. In other words, craft a list of reasonable-but-tough requests and demands for your soon-to-be neighbor and start working to make them happen. If neighbors spend all their time bitching they’ll miss yet another window of opportunity, this time to help turn this (perceived) lemon into something approximating lemonade. Mayor Chris Beutler said this morning that he won’t get in Walmart’s way on this project. (One can only imagine the fit Colleen Seng would be throwing right now if she were still mayor.) It’s very likely to happen. I hope neighbors figure out how to fight for themselves rather than just fighting against a perceived enemy. On Give to Lincoln Day, Lincolnites raised $1.3 million for a variety of local non-profits. The money will be used for everything from clothing foster children to rescuing animals to beautifying neighborhoods. The JPA recently approved $1.3 million to renovate a 1,200 foot train platform canopy. The money will be used to refurbish the steel and wooden structure. When you think about how you want your local community to spend $1.3 million, which of these feels better? Now, I realize there’s a bit of an apples and bananas comparison going on here. It’s really not fair to put these two numbers side-by-side. And yet, doesn’t seeing them presented this way kind of give you a crummy feeling in your gut? I appreciate the need for “atmosphere” in West Haymarket, and I understand why this canopy is going to be a part of it. But can anybody tell me with a straight face that refurbishing this old canopy for $1.3 million is a better use of funds than spending significantly less on a brand new replica? I’ll wager that there’s a healthy batch of talented local guys looking for work who could craft a darn good facsimile for half the cost of the refurbished original. I’m all for preservation, but I despise preservation for its own sake. It needs to be coupled with common sense. A significant chunk of this $1.3 million expenditure is far removed from anything resembling common sense. Cigarettes are about to be banned on many Parks & Rec properties. Areas affected by the ban include playgrounds, ballfields, skate parks, and the Ager Junior Golf Course. Parks and Recreation Director Lynn Johnson said people who smoke in posted areas will be politely asked to put out the cigarette or leave. Johnson’s statement raises more questions than it answers. First, who is “politely asking”? It’s not like there are City employees wandering around ballfields and playgrounds. Regular Joes like you and me could politely ask, but we can already do that. Tobacco users can now, just as in the past, politely tell us to go make love with ourselves. Then there’s the issue of telling an offender to leave. On what authority can a City employee tell a tobacco user to leave the premises? If the employee tells a person to leave and that person says no ... then what? Does it become trespassing? Can one legitimately be said to be trespassing on public property when his only crime is not, in fact, a crime? Caller: There’s a man smoking near the slide! 911: Smoking isn’t illegal, ma’am. Caller: But the sign says ... ! Caller: Send the cops or I’ll put out the cigarette on her face! Obviously an ordinance would be simpler. I spent this past weekend in Springfield, Missouri, home to a couple “diverging diamond” intersections similar to the one proposed for Northwest 48th and I-80. We drove through one of them. The most notable thing about it was how unnotable it was. I didn’t even know we were at such an intersection until we were halfway through it. It flows nicely, and concerns about how drivers will know where to go are significantly overblown. The driving process is readily apparent. The fact that the driver experience isn’t shocking is good news for Lincolnites. Once folks get beyond the novelty of it, the intersection shouldn’t be expected to cause any trouble. Then again, our multi-lane roundabouts shouldn’t be a problem either and look how much whining they’ve generated. I wish I had known I was approaching a diverging diamond intersection so I could have made a video or taken a couple photos. Alas, we were more focused on not getting lost than on documenting quirks along the way. I suppose you’ll just have to take my word for it when I say that Lincolnites may well survive this latest round of transportation trickery. An Office With a View. Of Stones. U.S. Property has purchased the Five Willows building at 48th and Pioneers and rechristened it Stoneview Center. I’m glad to see the building get some love. For one thing it’s in my neighborhood so I wasn’t crazy about the building sitting empty. And for another, it’s a shame to see all the money put into that property go to waste. The new concept for the building is interesting. For one thing, there’s office space (”Suite 100”) that includes an indoor walking track. That’s relatively unique. I could see some hip company leasing the space and using the track for r/c car races instead. There’s also a decent sized restaurant space, complete with what appears to be some old tanning equipment. Perhaps that could be used for some kind of newfangled cooking technique. All in all it looks like a good project, both for the building and the neighborhood. It’s a far cry from the old Food 4 Less that used to live there, that’s for sure. Good morning everybody! I just want to give a quick update on things going on in my life. June is turning out to be a crazy, crazy month. I just returned from a weekend trip to Springfield, Missouri, where I helped officiate their State Cup soccer tournament. This weekend I’m going to Kearney to mentor at a tournament out there. Later in the month I’ll head to Saginaw, Michigan to referee at the Region II Youth Championships; that will have me gone for a full week. And mixed around all of that I’m swamped with work. The consequence, unfortunately, is that blogging around here is taking—and will continue to take—a hit. It also means slow response times to those of you who have emailed me. If you do drop me a note I will do my very best to get back to you. Typically I leave emails “unread” in my inbox until I can give them the attention they need, so your note won’t just disappear. Thank you for hanging tight with me and continuing to check in for new updates. If I can survive June, the rest of the summer’s a breeze. This will be the first all vegetarian/vegan food truck in Nebraska. I need at least $8000.00 to get started. That will cover the purchase of the truck, rebuild, license, permits and insurance. I will take the truck throughout Nebraska featuring area farmer’s fresh organic produce. I will be able to set up at festivals, special events and be available for private on site catering.